The color, markings and size varies depending on the species of the wasp. General characteristics are two pair of wings and a pinched waist. Some species build above ground nests, like paper wasps or umbrella wasps, which can be found hanging from the underside of decks or soffits and other areas protected from the weather. Other species build in ground nests like yellow jackets. Entrances to these in ground nests will generally be protected from the elements as well such as under bushes. Wasps eat primarily insects and small animals though some species also eat nectar from flowers. Signs of a wasp infestation will vary depending on the species involved. The most commonly observed sign will be the workers or actual nest. 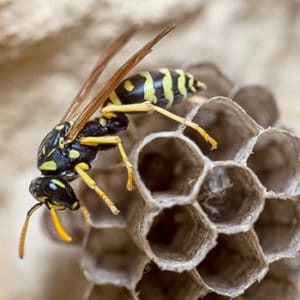 Because wasps do forage or search for food, it is not uncommon to see individual workers without having a nest or infestation on your property. In early spring fertilized female wasps construct their nests using fibers chewed from wooden fences, siding or dead tree limbs. Competing females becomes subservient to the queens who are successful in completing and defending their nests. First and second generation wasps are all females, males are not produced until later in the year.